Influnce of water can be considered using following options: general shape of GWT, horizontal GWT or directly by water acting on the blocks. General shape of GWT is entered as a polygon. 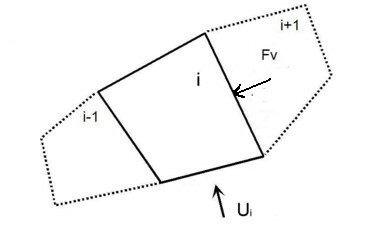 The pore pressure (stress) on the slip surface is considered linearly according to the equation: u = γw * zw. The resultant forces U (force due to water on slip surface) or Fv (force due to water on internal slip surface acting on the submerge part of joint per metre of width) are calculated from the pore pressure load diagrams. The horizontal GWT is entered by constant height hw over heel of the slope (from the origin of the coordinate system). Influence of water is considered from the water level (GWT) to a given point on the vertical. It must be introduced into the analysis whenever the presence of water in the joints between blocks is expected. It is applied as a resultant force Fv in kN (the pressure acting on the immerse part of the joint per 1m run is considered). It is defined as hydrostatic pressure on each slip surface of the polygon (external slip surface) separately and introduced as an external load (uplift pressure) U in kN, which can be reduced depending on the slip surface permeability (the pressure acting on the immerse part of the slip surface per 1m run is considered).